We have a fun business. That’s why we say we “Deliver Marketing Joy.” When you receive something from us (if we get it right) you get a little piece of Christmas morning. We hear stories of teams gathering around a box to see the latest goodies that have arrived. That is so cool. We do fun stuff. As I have heard PPAI’s Paul Bellantone say, “It’s the only kind of marketing that your clients actually thank you for!” One of our challenges, however, is the diverse range of products and services we do offer. Being in this business, it’s easy to get pigeon-holed. We can become the “t-shirt guy” or the “pen gal,” or “weird guy who sells calendars.” Titles can be tough. 🙂 With approximately a million products to showcase, it’s hard to let our clients know ALL the things we offer. So how about a test? Did you know? Here are a few product categories where we shine. Custom Awards: A great way to make employees and team members feel appreciated is with a custom award program. Yes…we do that. We even helped one of our clients create a really cool award program for their top customers. Read more here. Regardless of who you want to recognize, a cool custom award could be the perfect way to leave an impression. Print: From flyers to calendars to business cards, we work to be a one-stop marketing solution. And with a full time graphic designer, we can help you look good! I mean, we know you look good, but we can help translate that to paper! Signage: One of the reasons I love our Trade show is that it gives people a chance to see this up close. We have a full selection of trade show displays, banners and so much more. Oh…and that design capability is super important here too. Food Gifts: This is a great time of year to talk about this! During the holiday season, food gifts are a great item for offices. Not only is it personal, but it’s shareable. And though you might normally think of the local grocery store (they are great) or a big box store (not so great at this), we can be a great option for personalized food gifts during the holidays. And those are just a few things you might not have known we offered. It’s not your fault! It’s hard to keep track. Make sure you never miss an update, or a product category! Sign up for our VIP newsletter. How does it work? We gather all of the content we create and send one email per week to catch you up! Sign up below. It’s time to bridge the Appreciation Gap. It’s time to tell our best customers, employees, board members (and others) how much we appreciate their time, effort and money that they give us! In short, it’s time to say “thank you.” This is the time of year to find those ideas…and we are here to help! That’s why we wrote this blog about 7 Spectacular gift ideas for the year end. These are sweet. On the other hand, not everyone has the same budget! So we want to give you options! 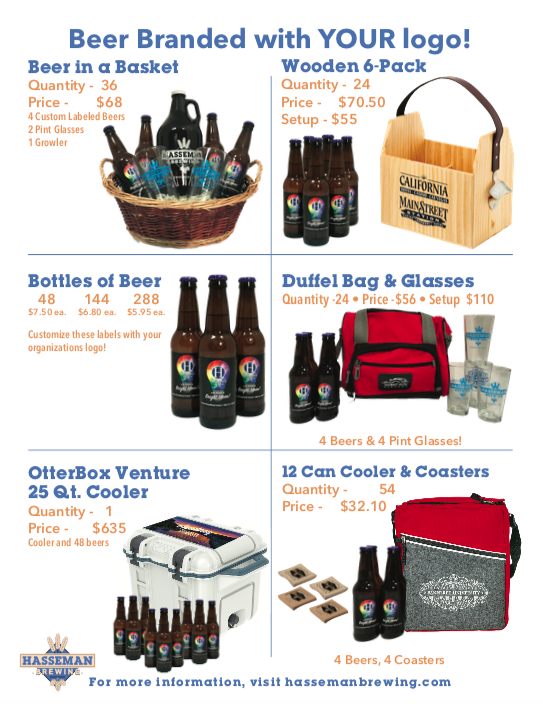 With that in mind, here are some really cool branded merchandise items that are under $25! UL Persona Power Bank: Though you might be thinking that not everyone on your list is perfect for a tech gift, nearly everyone has a phone! And if you have a phone, you know the frustration of having it get low on battery. Here is how you swoop in to help! 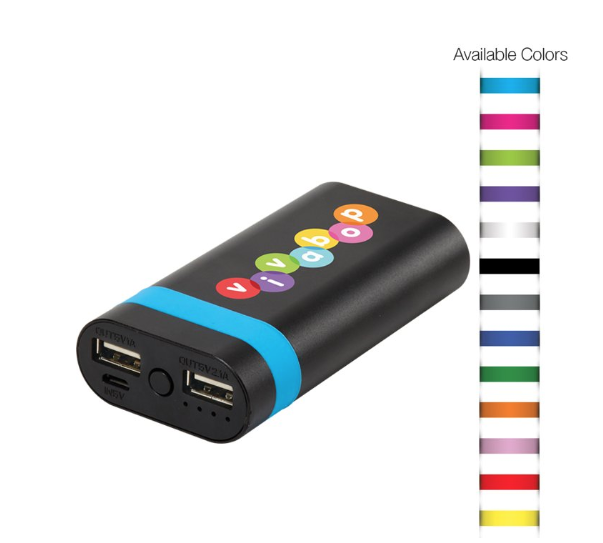 This cool looking power bank will charge their phone quickly and efficiently…and look cool in the process! iRock Elite Bluetooth Speaker: You can help your team keep the holidays festive with this bluetooth speaker! It’s small and cool looking with a good sound. In addition, it has a built in microphone so you can even take calls while using it. It’s perfect for that “business in the front, party in the back” kind of day! Pivot Stand Worklight: For the people on your list that love to “get work done,” this one is super functional. With a design that allows the light to be set up a different angles, this throws out a lot of light so you see it tight spaces. Urban Peak Quest 12 Can Cooler: If you want to give the people on your list something super functional AND fun, then this might be for you. The thicker inside liner is designed for longer lasting lift and more wear and tear (think better quality). Do you know anyone on your list that might need a cold beverage during the holidays? We do too. So that’s just a quick list of cool items under $25! Want more ideas? You can email your Hasseman Marketing rep! Don’t have one? No problem. Click here to find more “marketing joy.” Or click here and we can get you hooked up with someone right away. Finally, make sure you never miss an update. Sign up for our VIP newsletter right below! It’s that time of year. What time of year, you ask? It’s that time of year that the mornings get cooler, the leaves begin to change colors, and football is on TV! Hooray! It’s also the time of year that most organizations need to start thinking about “thank you.” It’s time to make sure your customers, employees, sales team and board members know how much you appreciate them. (It’s time to bridge the Appreciation Gap…I talk about that here). But what do you get them? How do you make it special? We can help. Today we take a look at some really cool executive branded gifts your team will love. Sonosphere Bluetooth Speaker: This is the perfect executive gift for that person that spends time at their desk. The Sonosphere will serve as a constant reminder of your appreciation for them. And since the minimum is 1…you could even personalize it. iLuv Personal Assistant/Bluetooth Speaker: Speaking of tech, how about tying your bluetooth speaker into your personal Alexa assistant? Yes…that would be cool. Your special guests can do just that with this cool piece! RamblerPack Backpack: Simple. Functional. On trend. This backpack fits in all 3 of these categories. Make sure you can head from the office, to the gym, to wherever and do it in style! Check out details on this one here. Urban Peak Gift Set: I love this gift set so much I got it for my team last year! This awesome cooler bag (great functional size) pairs with all of the drinkware you could need! It comes with 3 Vacuum sealed pieces with the 30 oz, the 20 oz and the 3 in 1. This is cool for everyone on your list! Coleman® 36-Hour 42-Can Marine Soft-Sided Cooler: If you want my favorite cooler on the market right now, you have found it. I even wrote about it here. This is a great size because it holds 42 cans, but is still manageable. It keeps ice for 36 hours and it has a cool accessible top that I love. You can find more info here. Thumpah Bluetooth Speaker: Get the party started, well, thumping with this super cool bluetooth speaker. If you have someone that wants to experience music on the go, this is your go to item! Westbridge Leather Rucksack: this piece is sure to impress. Okay…so that is a great place to start! There are plenty of other options available! Need more ideas? You can shop online here. Or we can help you as well. Just click here if you need more ideas or if you want to set up a consultation. Finally, make sure you never miss an update. Sign up for our VIP newsletter here. But this week the BrandSLAM is all about fun and function! The 12 Can Duffel Cooler is one of our favorite pieces because it puts the fun back into function! Yes, you can fit 12 cans of the beverage of your choice in this great looking bag. So it’s plenty roomy. But it’s also a great size for a real size lunch for work! And since it’s got the water proof inside liner, it’s great to be used simply as a duffel. One of our clients used it just as a gun bag! 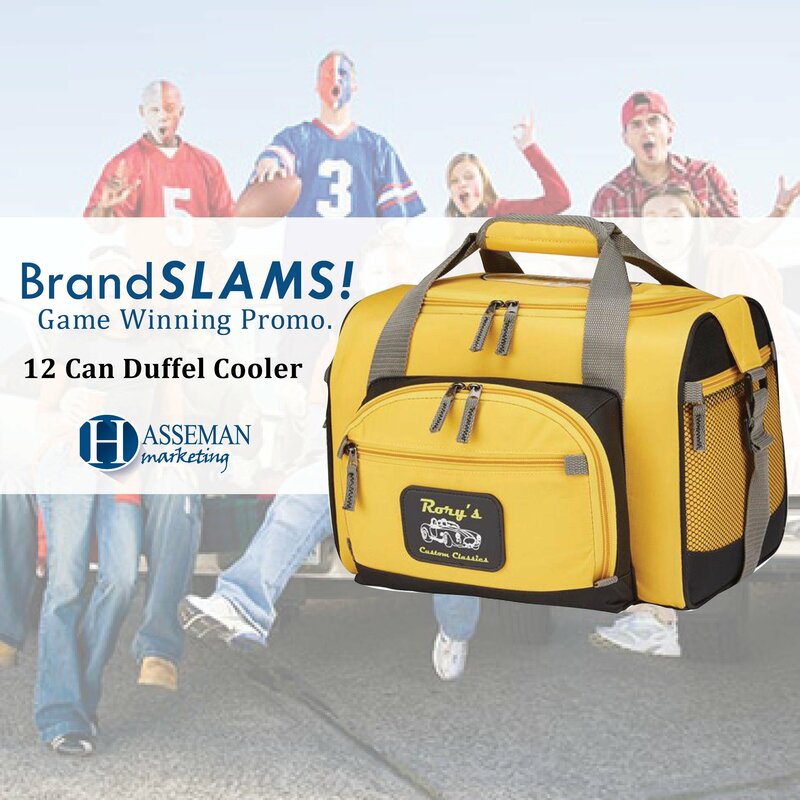 Any way you want to use it, the 12 Can Duffel Cooler is perfect for people of all ages, sizes and gender! And because it comes in SO many fun colors, you can match nearly anyone’s colors. This one is a true BrandSLAM!